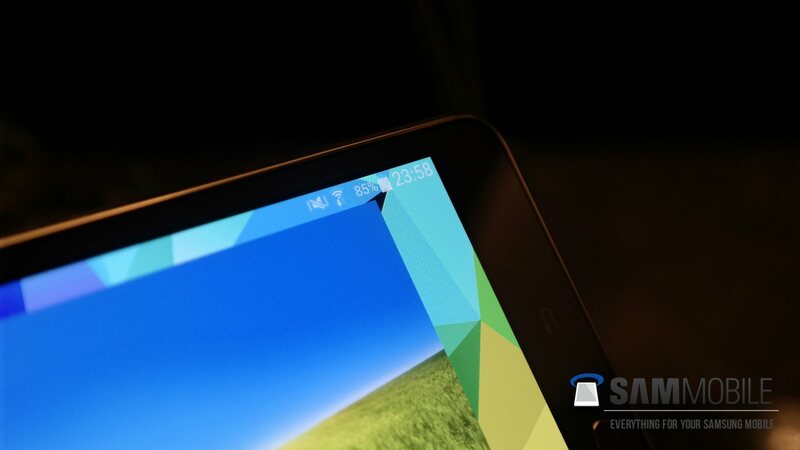 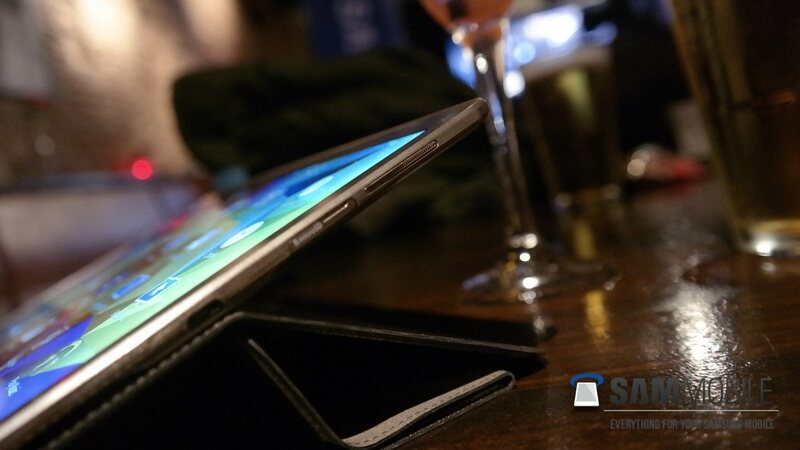 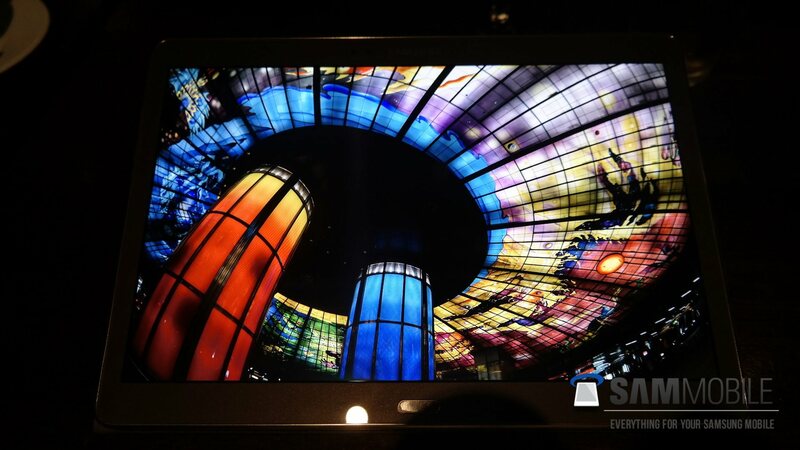 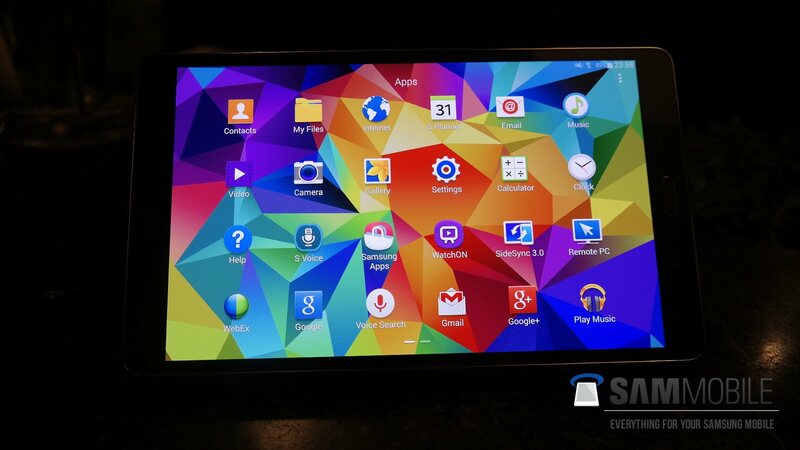 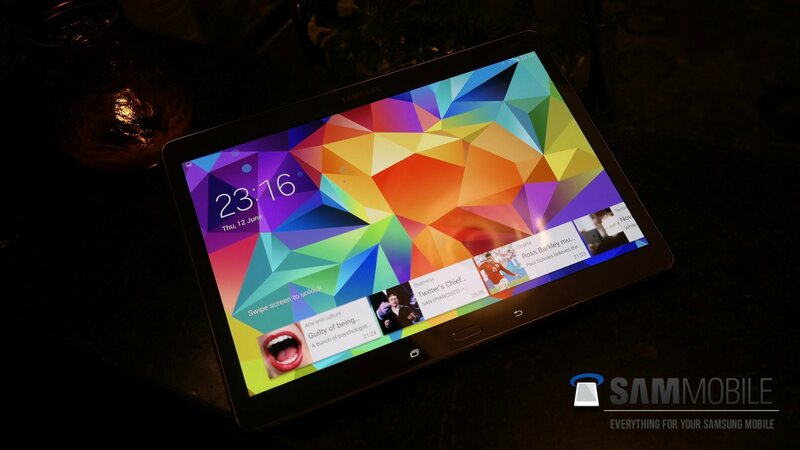 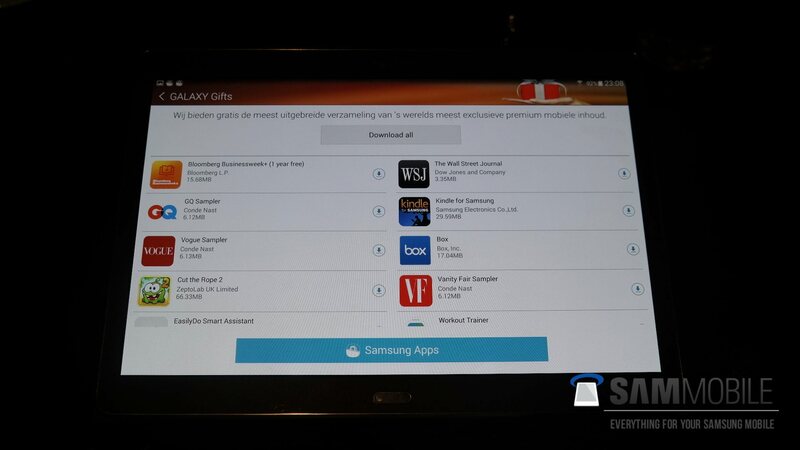 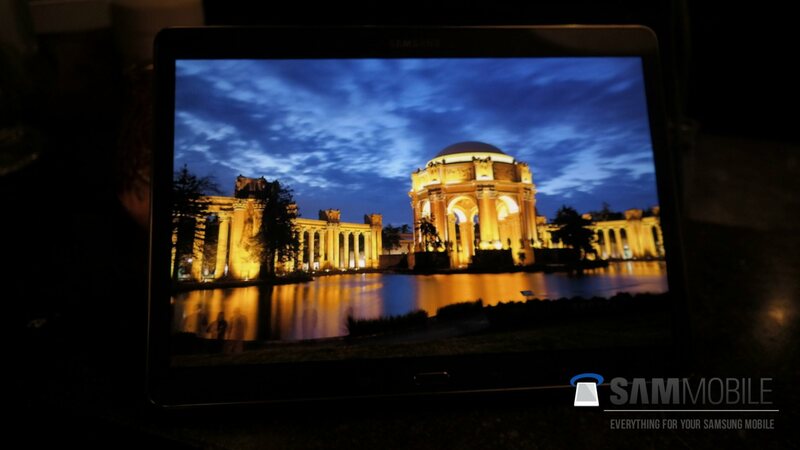 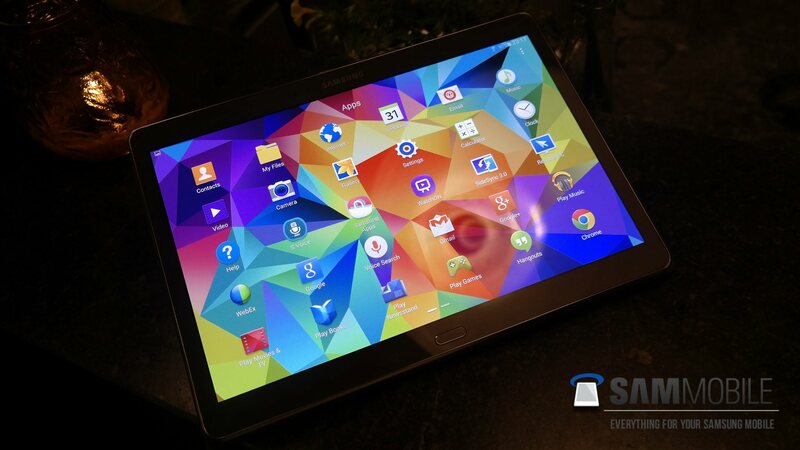 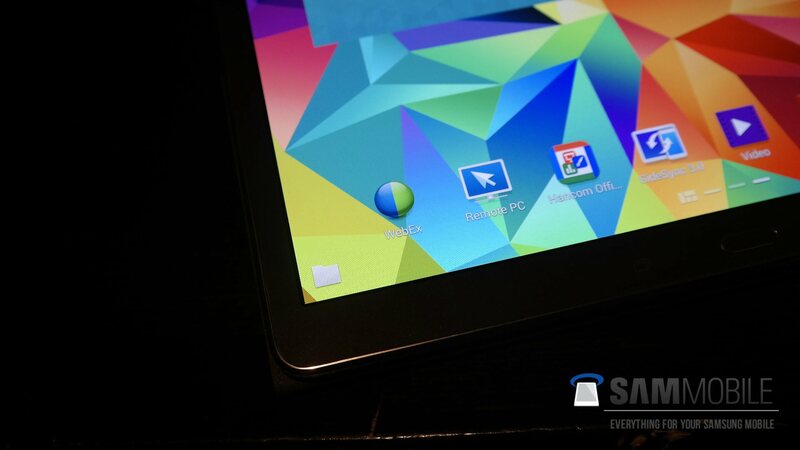 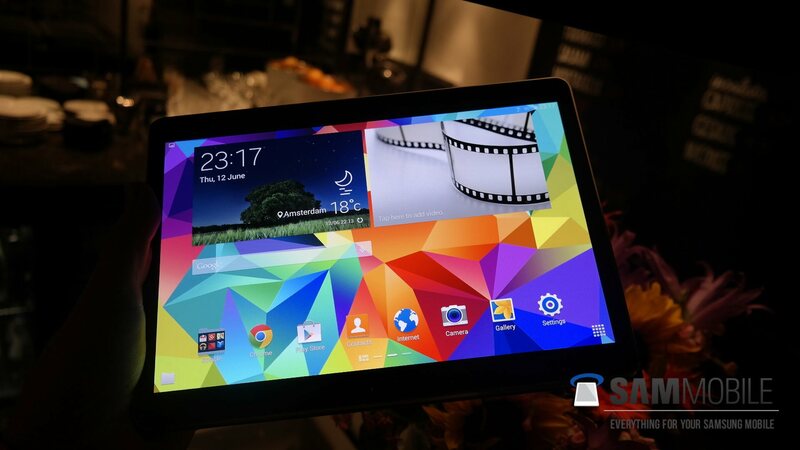 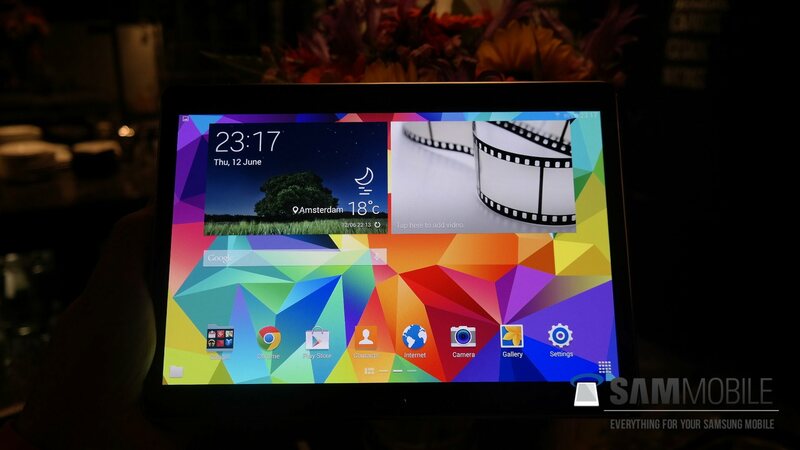 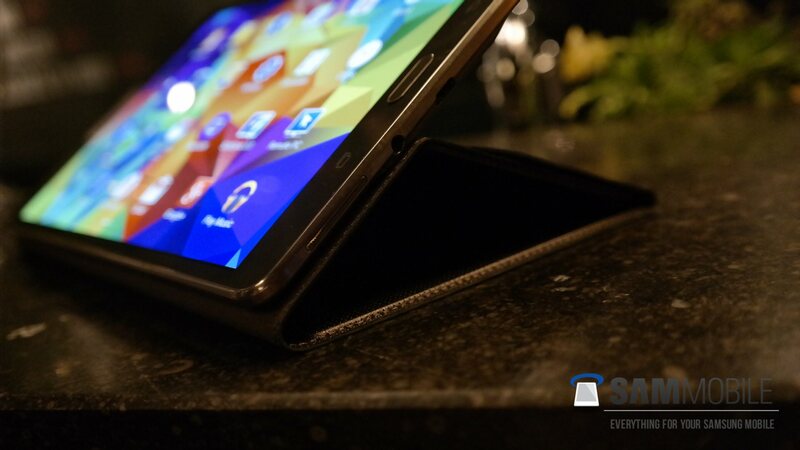 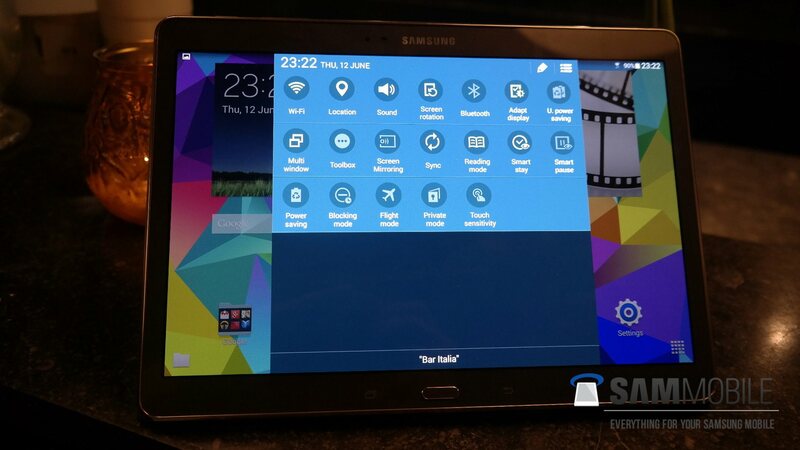 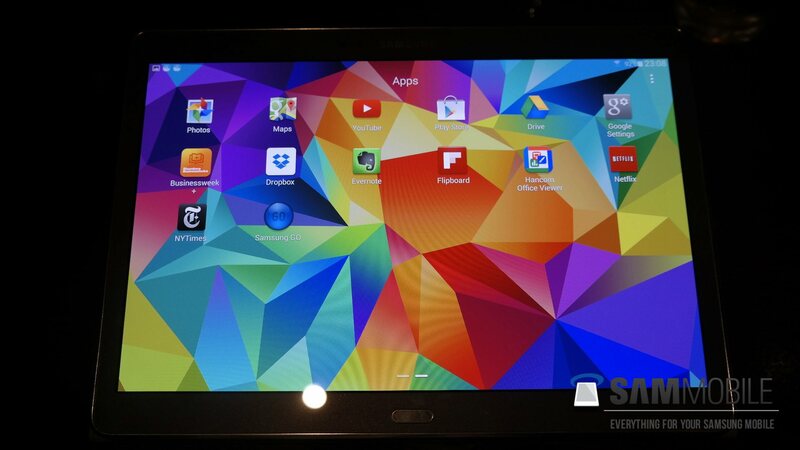 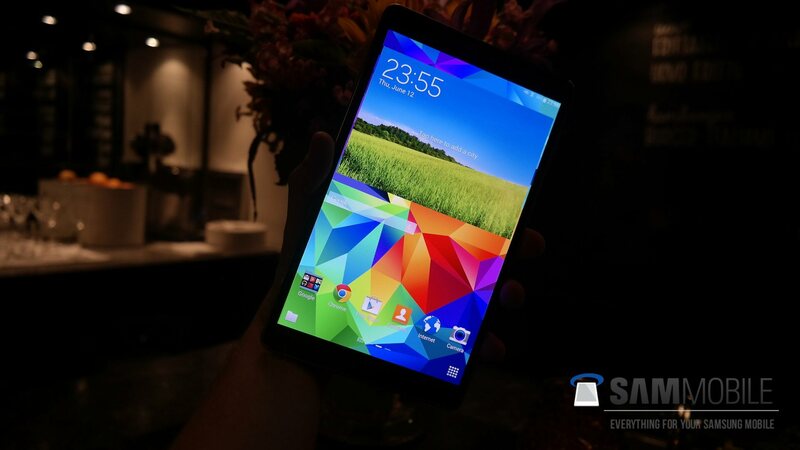 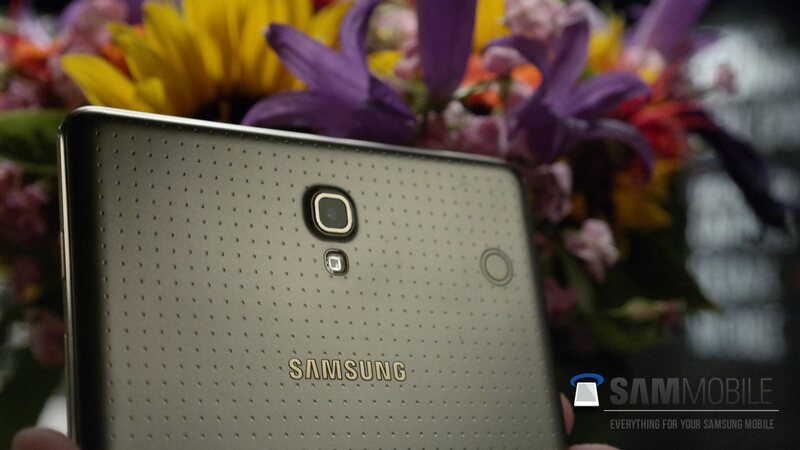 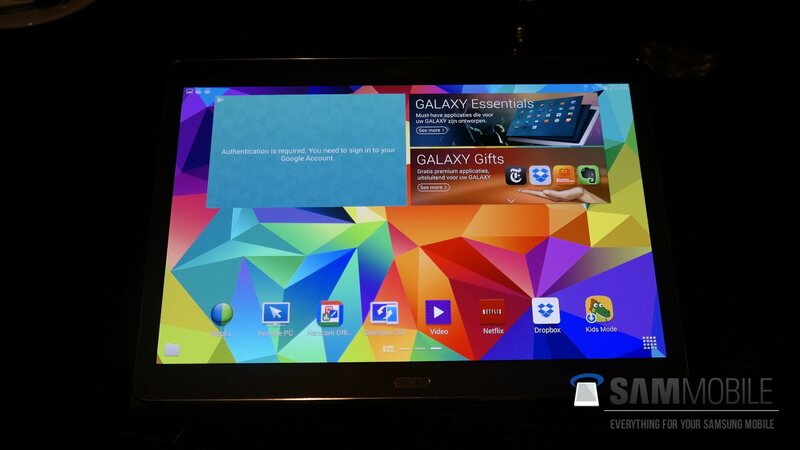 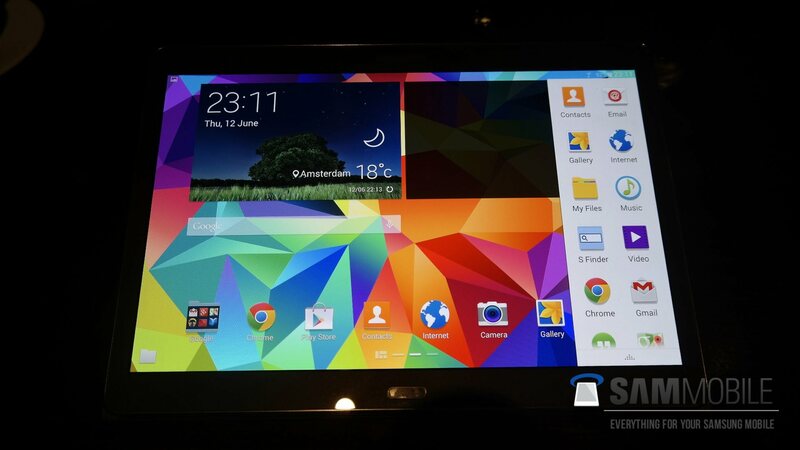 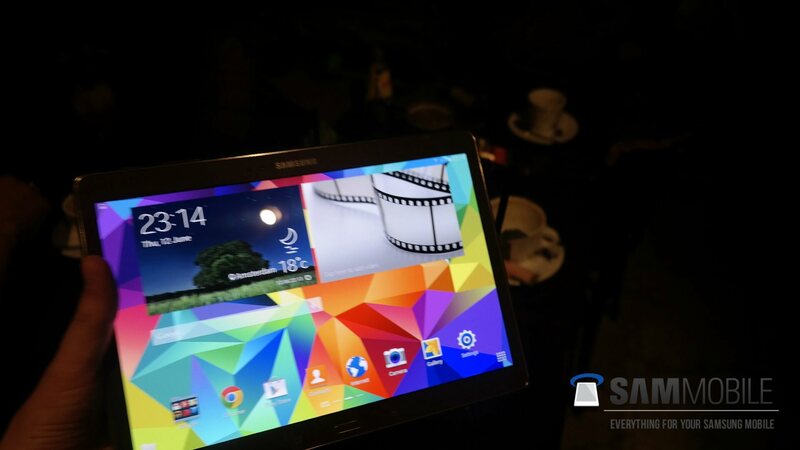 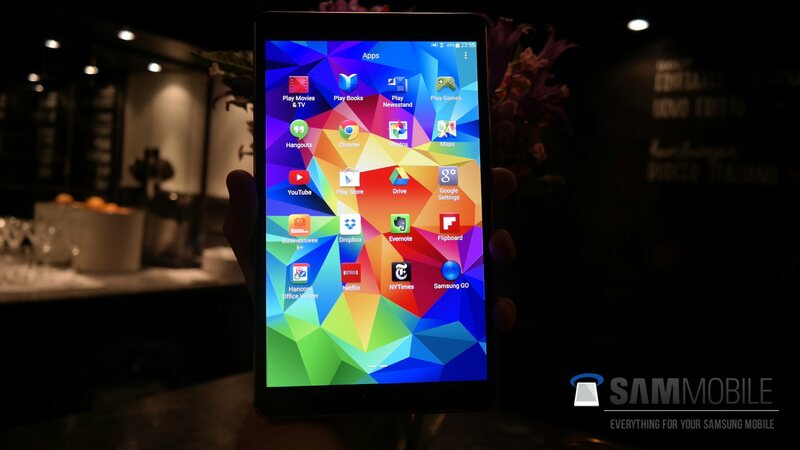 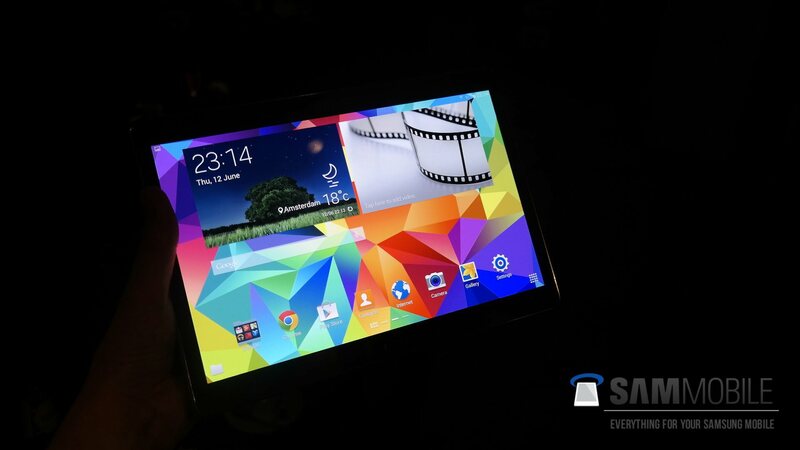 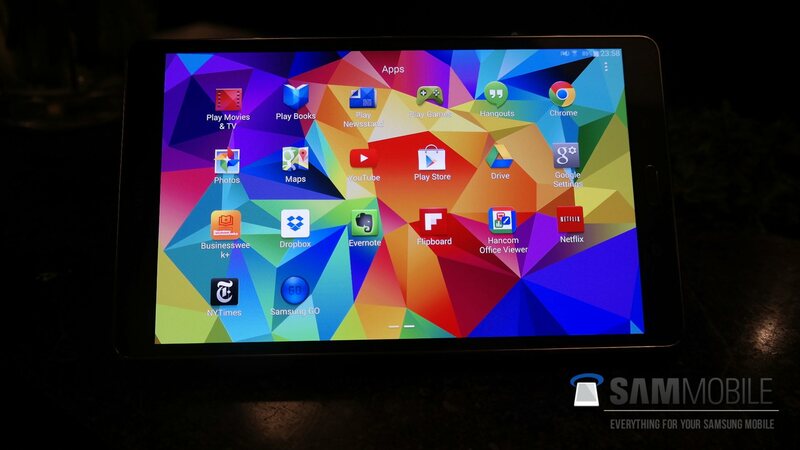 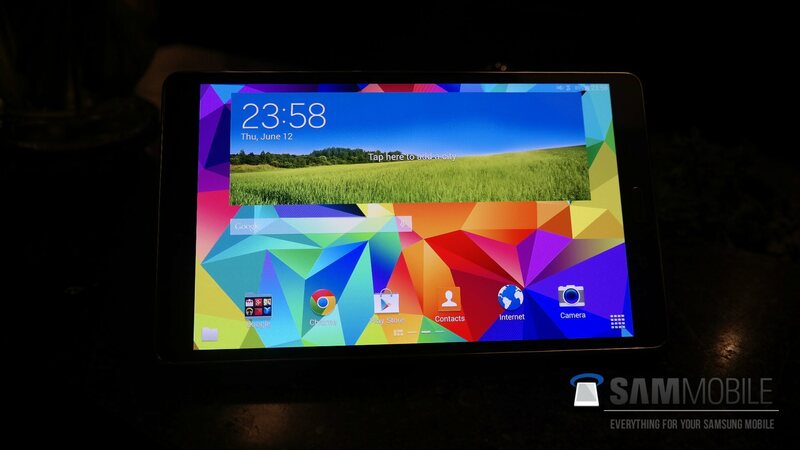 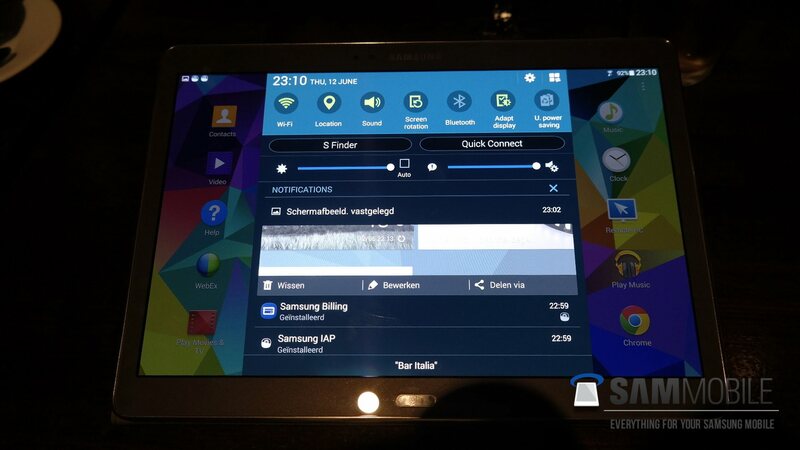 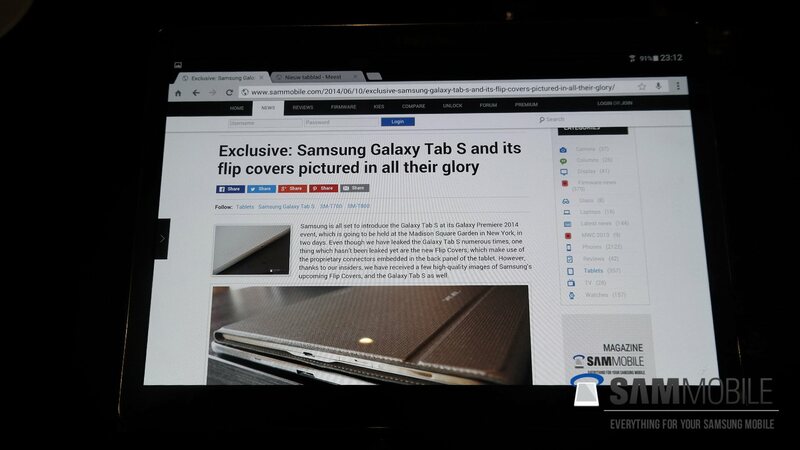 After months of rumors and leaks, the Galaxy Tab S was finally made official by Samsung at its Galaxy Premiere event. 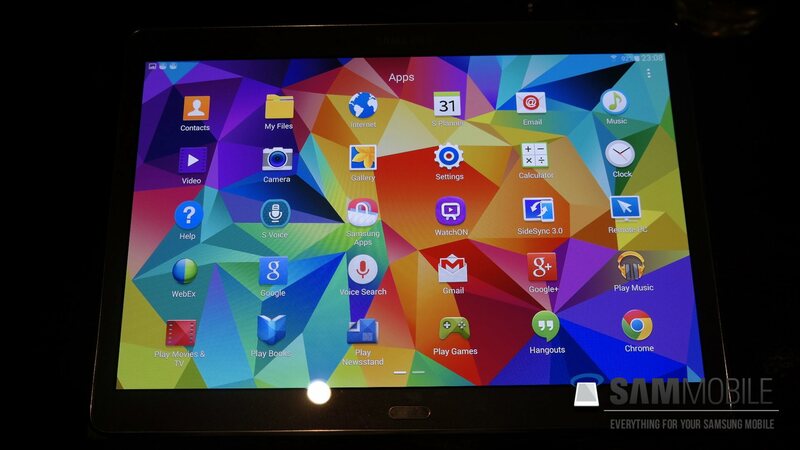 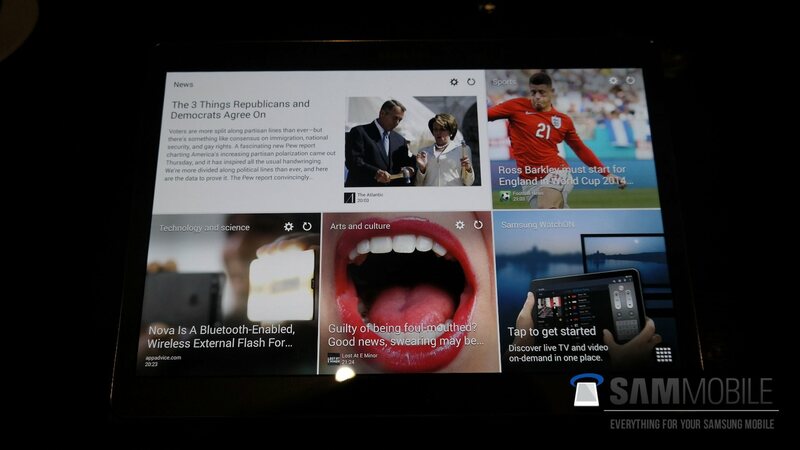 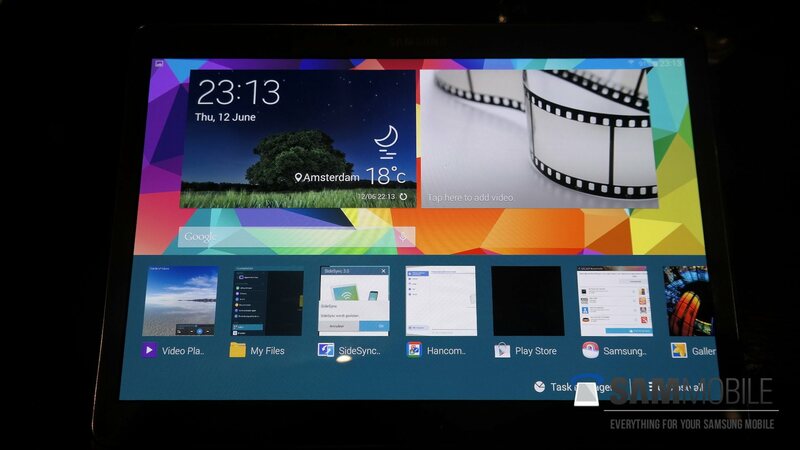 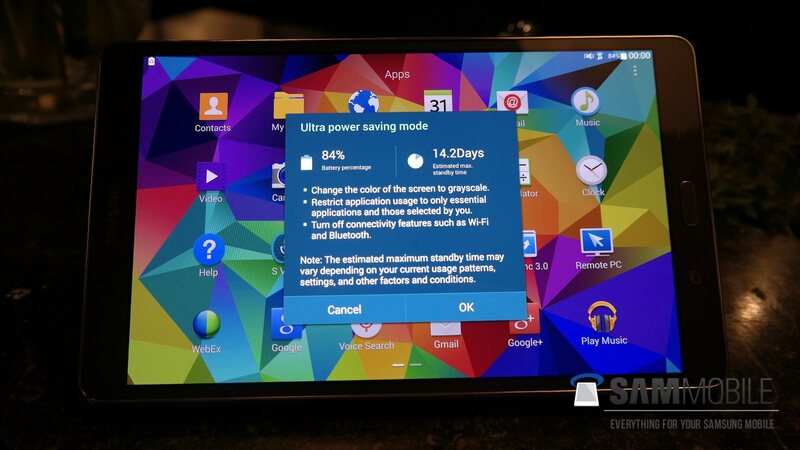 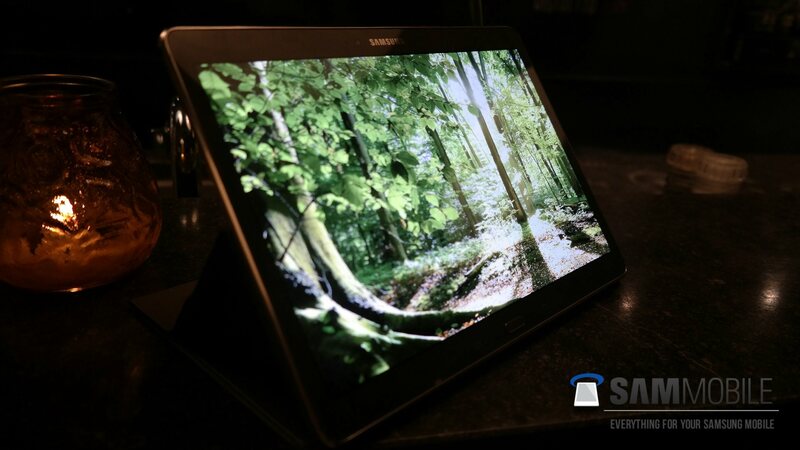 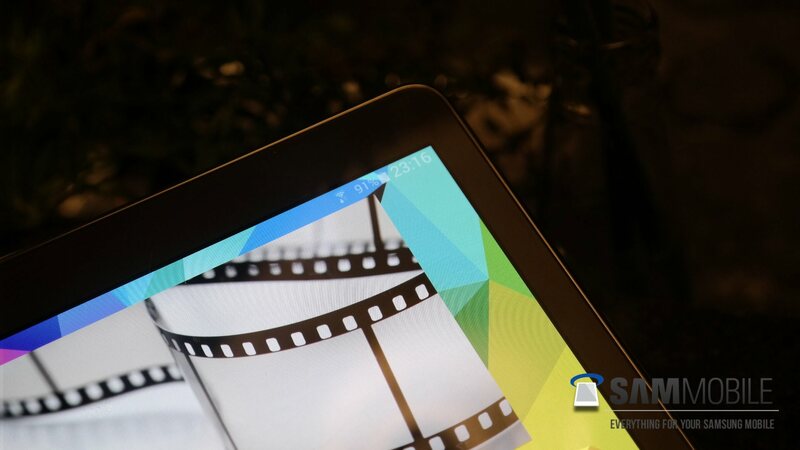 The Galaxy Tab S marks Samsung’s return to using AMOLED displays on a tablet, after a one-time experiment with the Galaxy Tab 7.7 back in 2011. 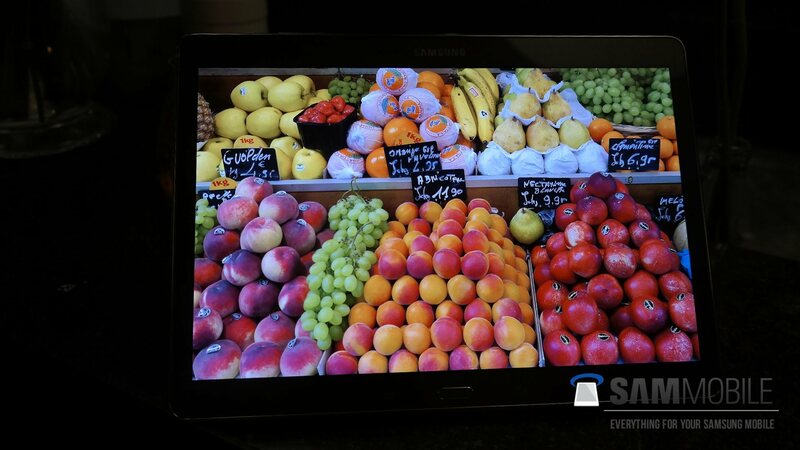 Compared to the Galaxy TabPRO and Galaxy NotePRO tablets, not much has changed, but as we had always expected, the AMOLED displays are the stars of the show here. 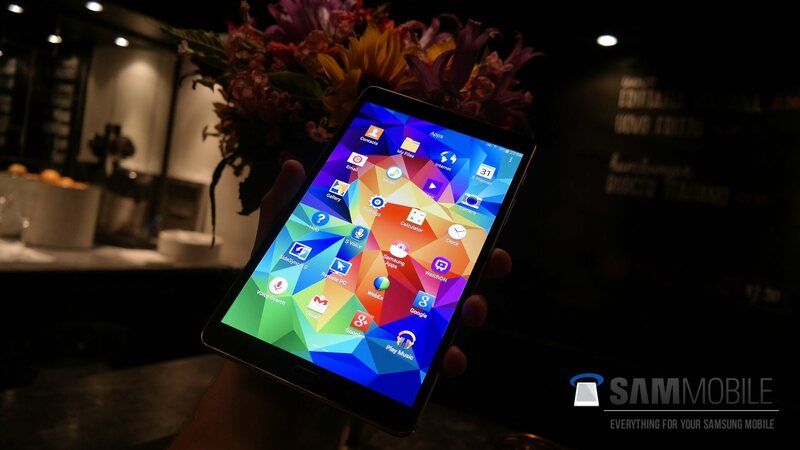 We were able to get some hands-on time with both 8.4-inch and 10.5-inch variants of the Galaxy Tab S, and came away rather impressed. 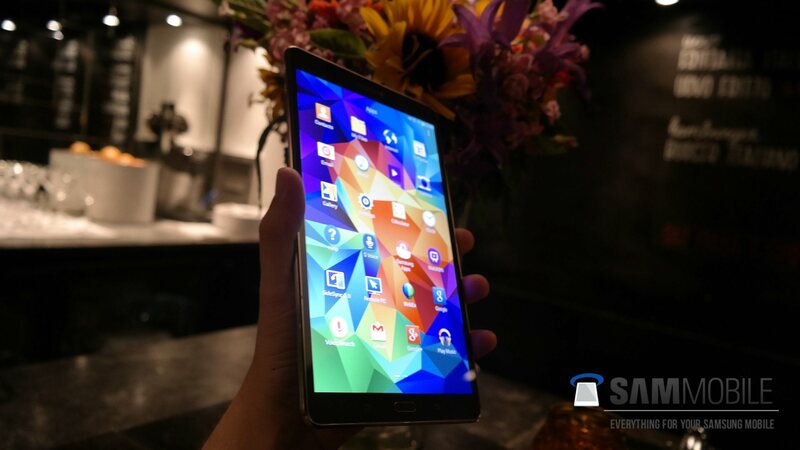 At first glance, the Galaxy Tab S lineup is rather attractive, with an impressive design that minimal yet quite sleek, with the extremely thin bodies (6.6mm on both 8.4-inch and 10.5-inch models) only help to make the Galaxy Tab S one of the best-looking tablet series around. 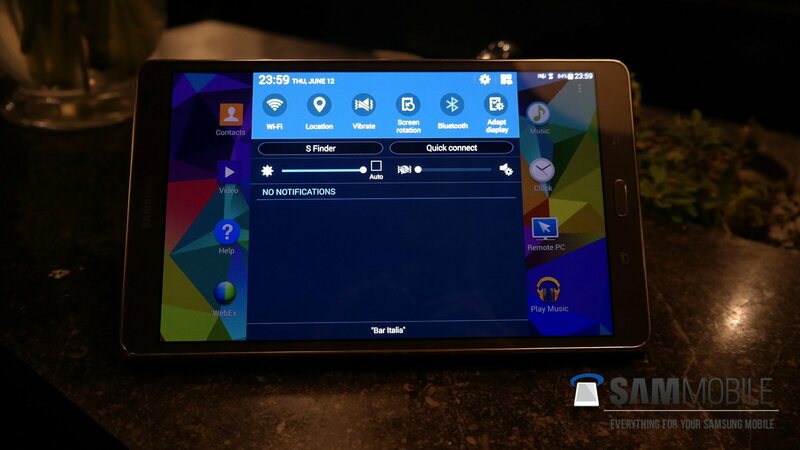 The setup is quite familiar – the front includes the screen and Samsung’s traditional three-button layout with home, recent apps, and back keys. 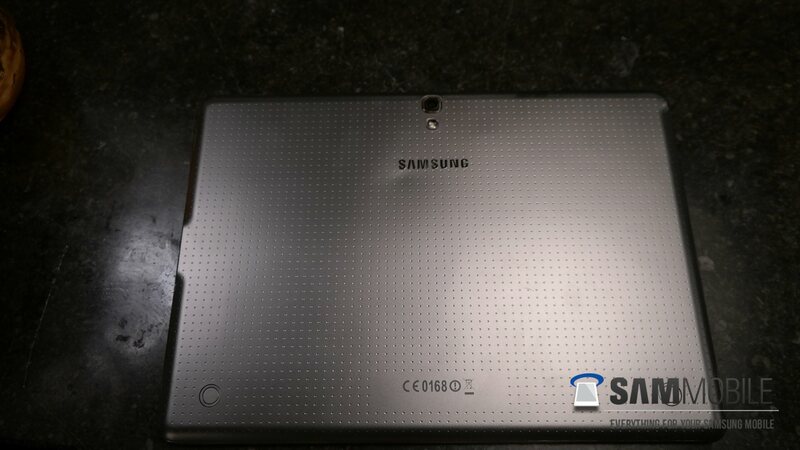 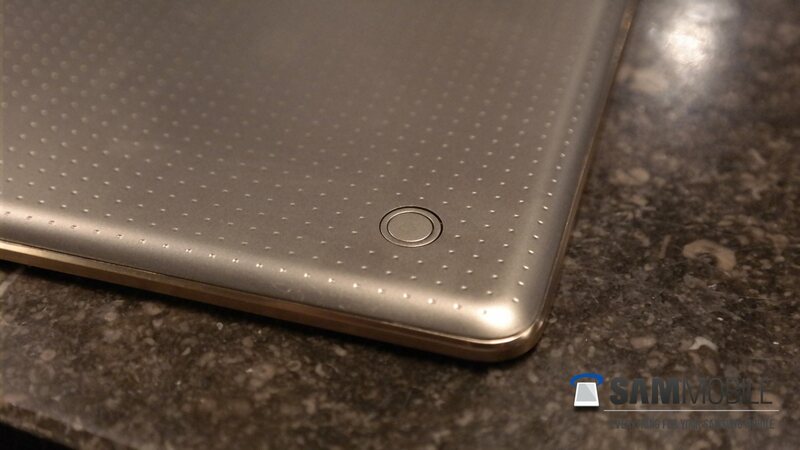 On the back, the awesome new dot pattern that we saw on the Galaxy S5 is present, and it frankly makes holding the Galaxy Tab S tablets very ergonomic, which is good especially for the 8.4-inch variant, which you will be gripping with one hand more often. 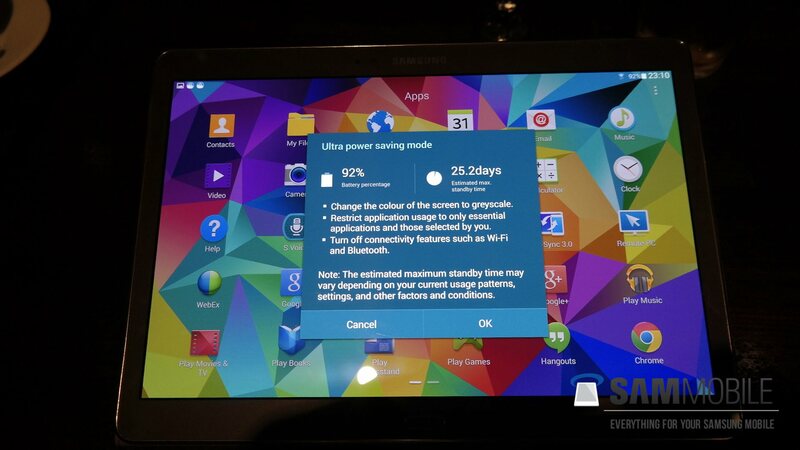 However, it is when you power on these tablets that the magic happens. 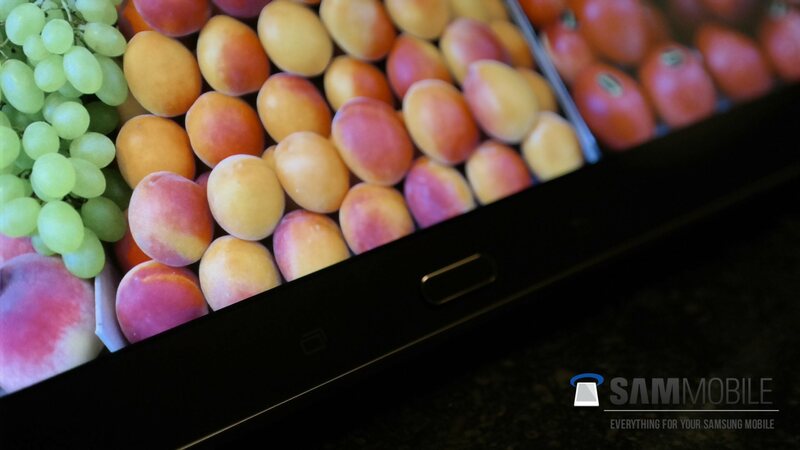 Samsung’s Super AMOLED displays have always attracted us with their vivid colors and deep contrast, and the beauty is exemplified on the larger displays. 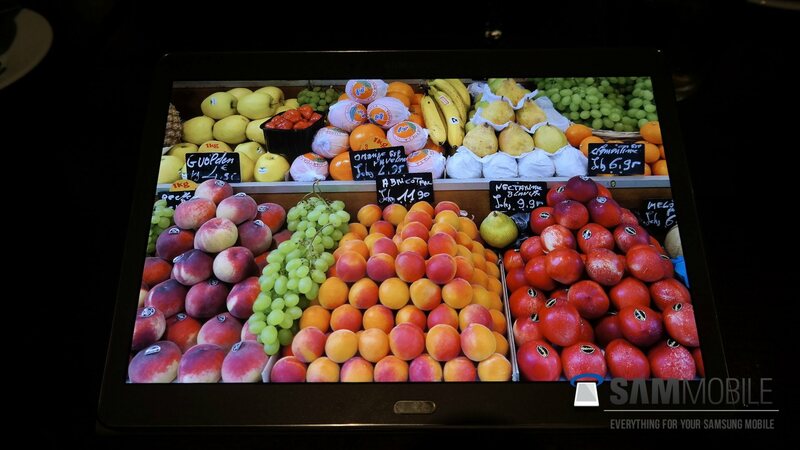 Things really popped out of the screen and made us just stare at them for a few seconds, before we managed to come around and actually start using the tablets. 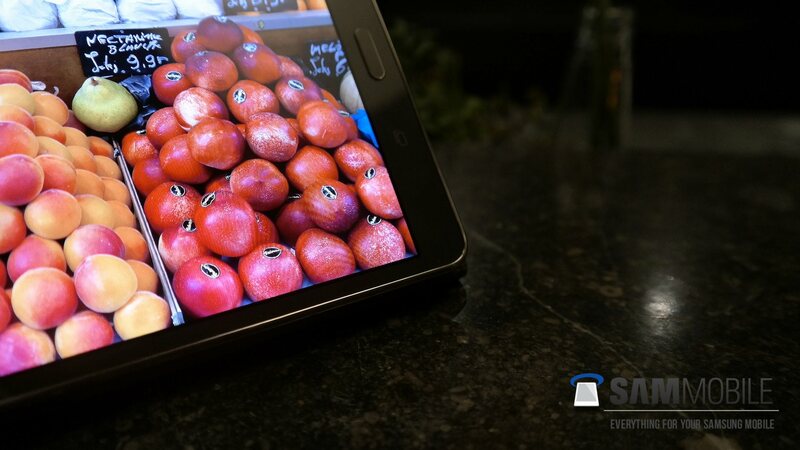 Samsung has pretty much perfected its AMOLED displays on phones, and we’re happy to say that the Galaxy Tab S displays are even more pretty to look at. 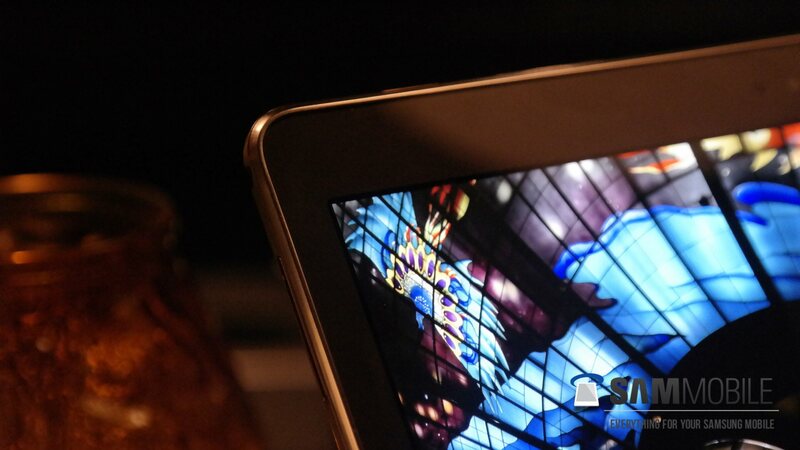 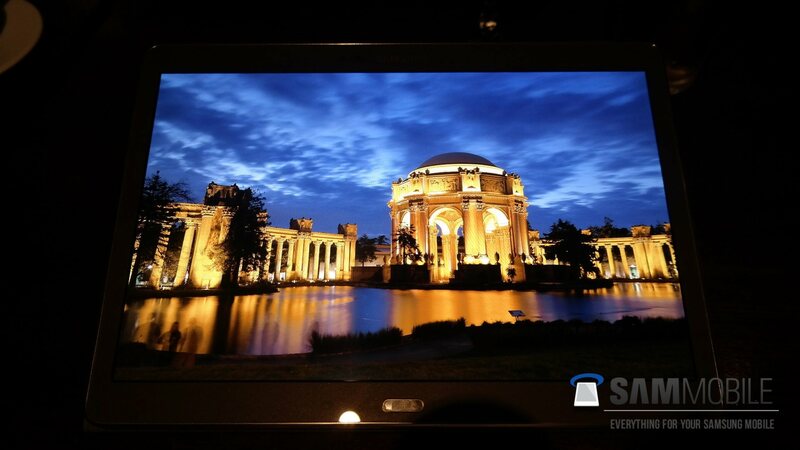 Like other high-end tablets, the screens are extremely sharp as well thanks to their 2560×1600 resolution, and all in all these are pretty much the best tablet displays that you will ever see. 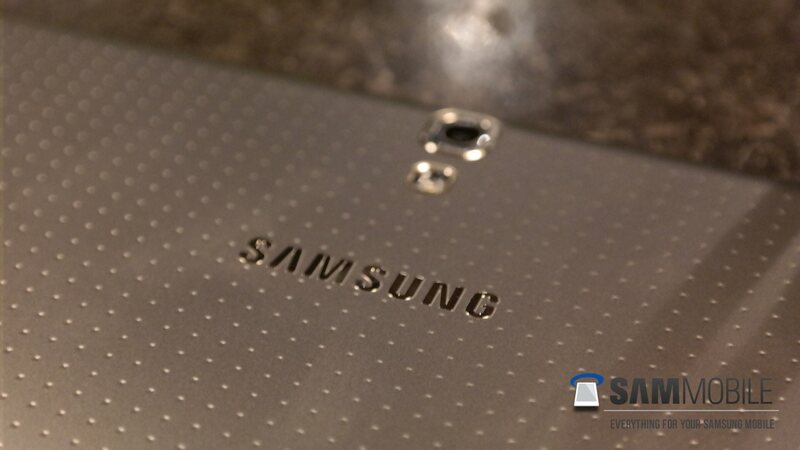 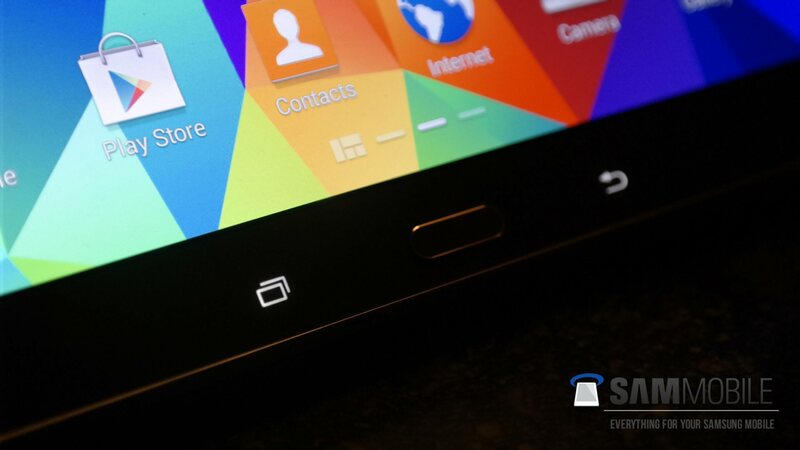 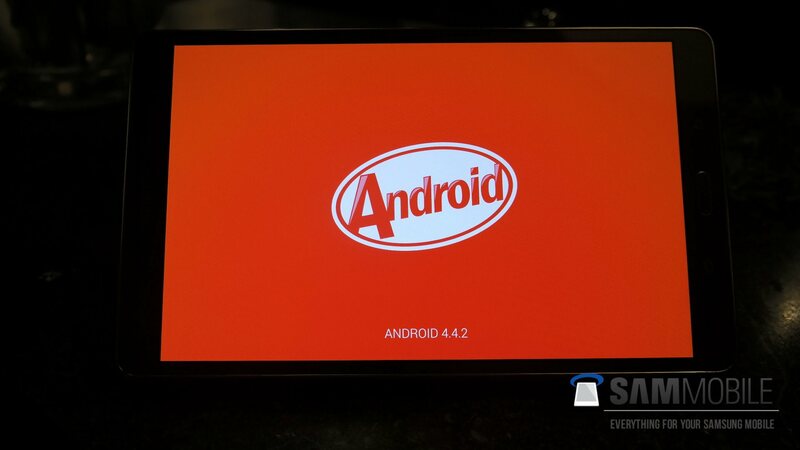 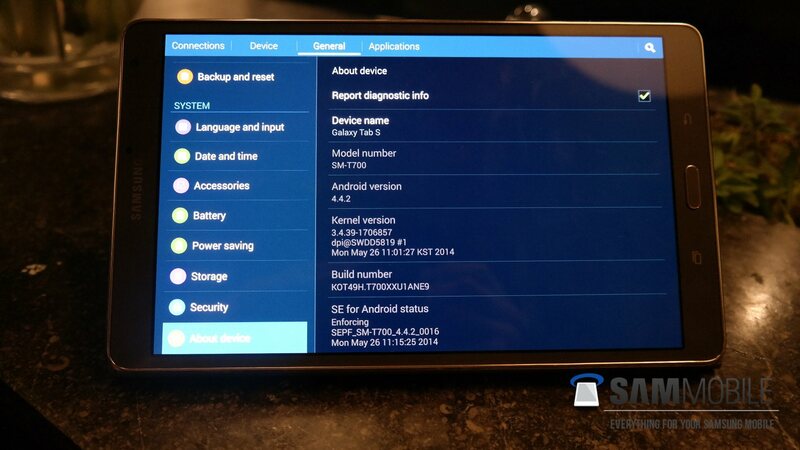 While it’s not visible, the home button also has a fingerprint scanner integrated into it, similar to the Galaxy S5. 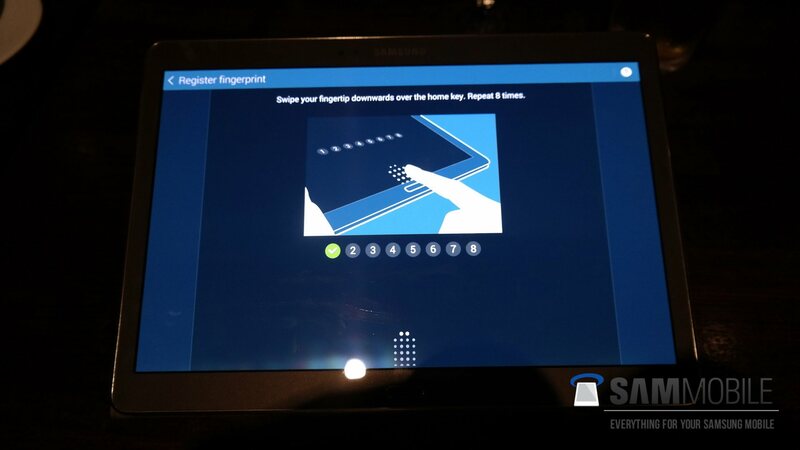 It can be used for unlocking the device, making PayPal payments, browsing a private mode that you may have set up, and even for logging in to different user accounts. 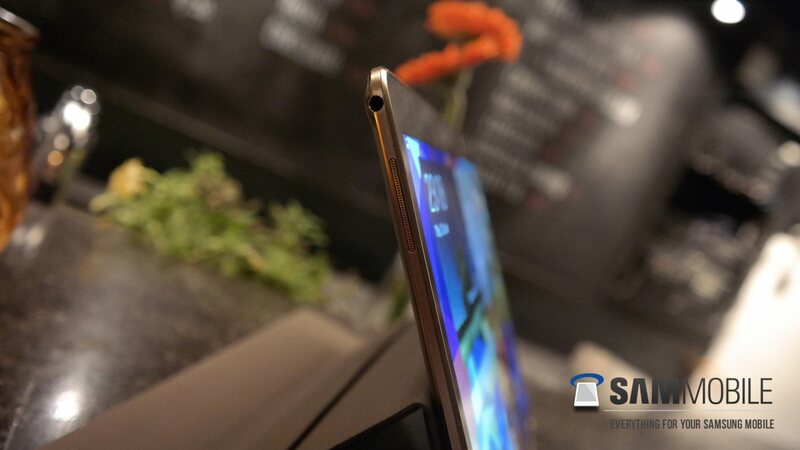 Its accuracy was top-notch, and you probably won’t be fiddling to make it work considering you will be holding on to both tablets with two hands in most cases, which makes swiping on the fingerprint sensor way more convenient than on a smartphone. 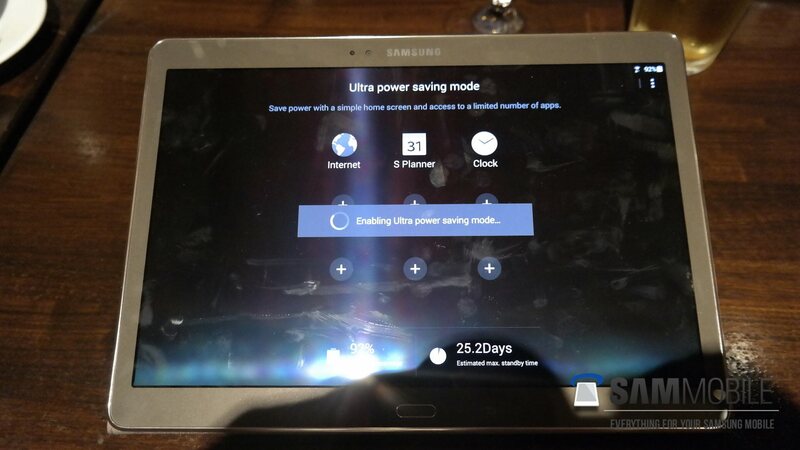 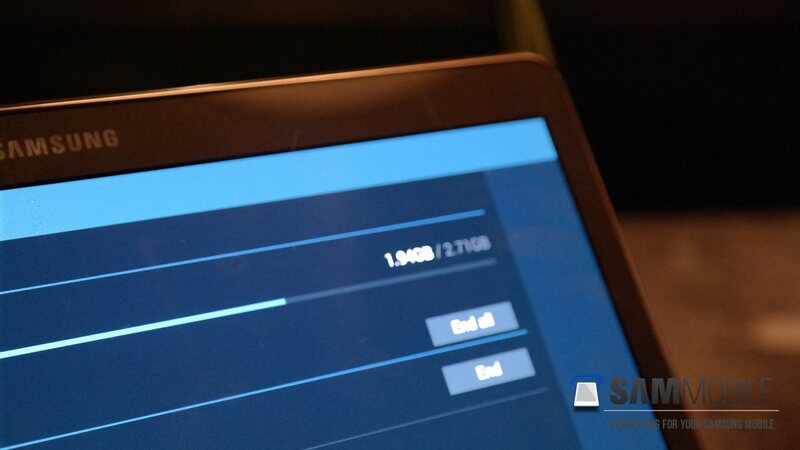 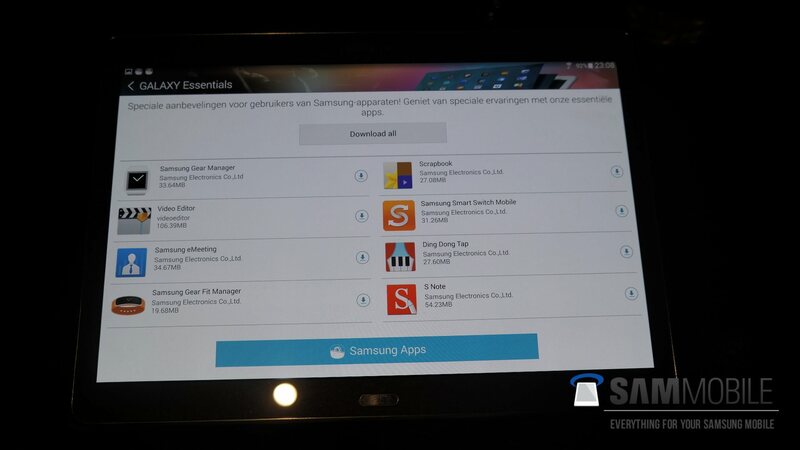 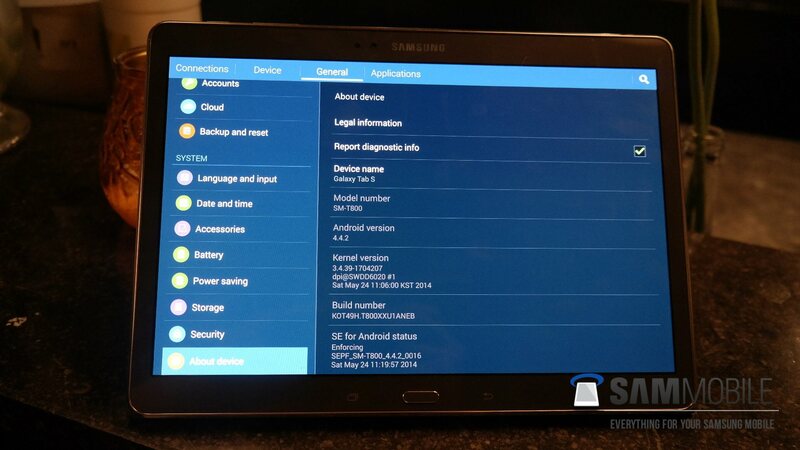 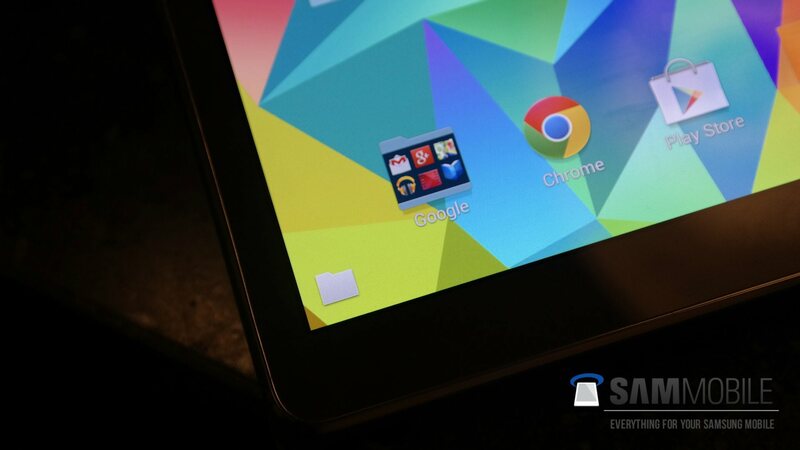 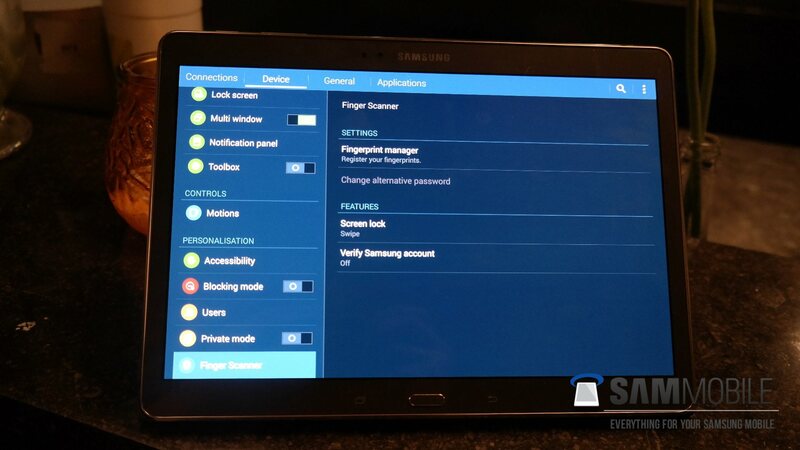 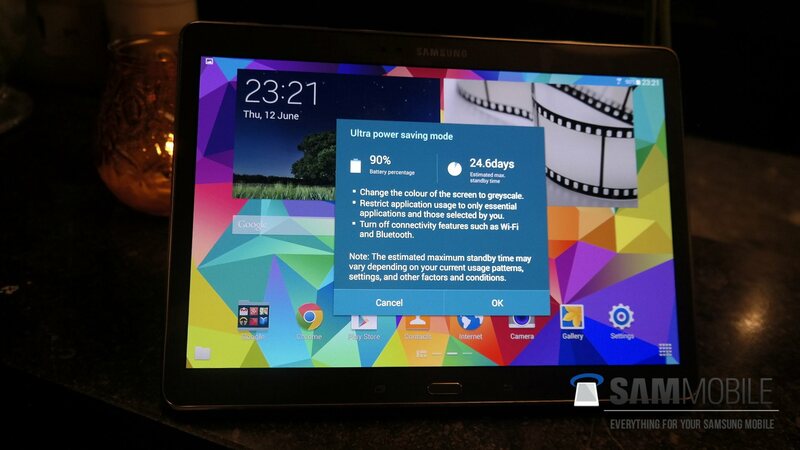 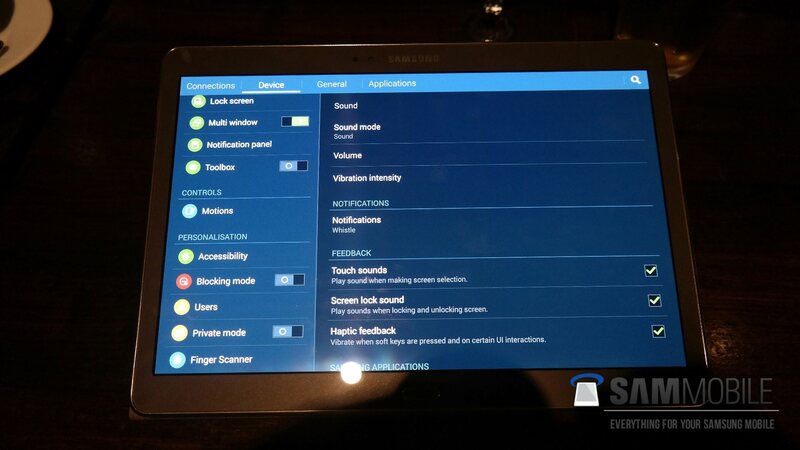 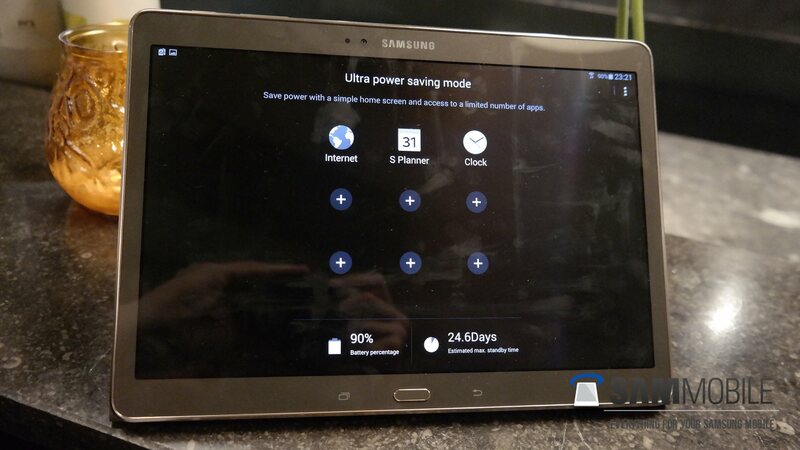 The software on the Galaxy Tab S feels pretty similar, which should be especially true for those who have used the Galaxy TabPRO or Galaxy NotePRO tablets, and everything seems to run smooth and quick, though there were a few stutters here and there that are to be expected with pre-release software. 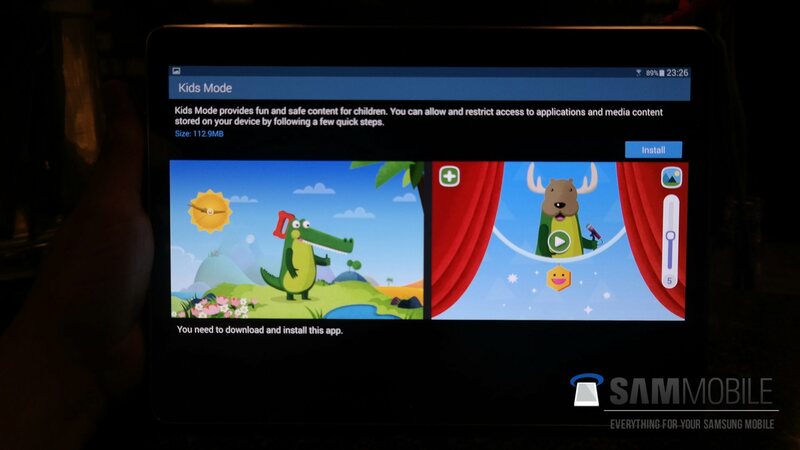 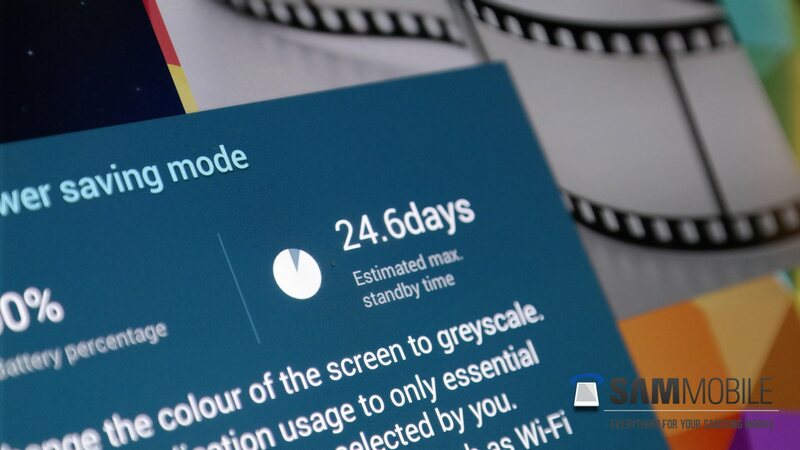 There are quite a few features here that have been taken from the Galaxy S5, including Kids Mode and Ultra Power Saving Mode. 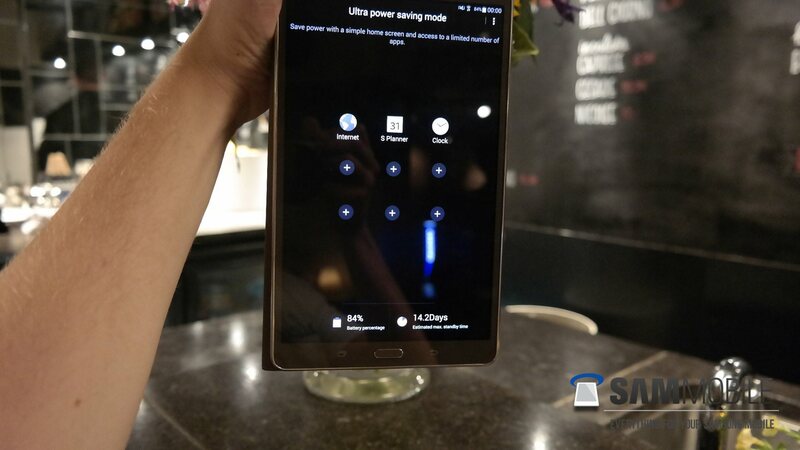 An interesting feature is Call Forwarding, which will let users make or take calls through a connected phone right from the tablet, though this is something we will be able to try out when we get our hands on review units. 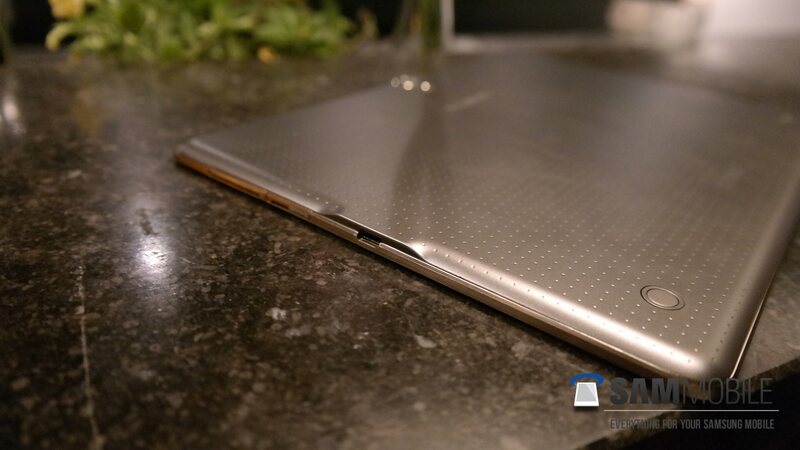 Many have wondered what Samsung is trying to achieve by launching new high-end tablets so soon after the Galaxy TabPRO and Galaxy NotePRO lineups. 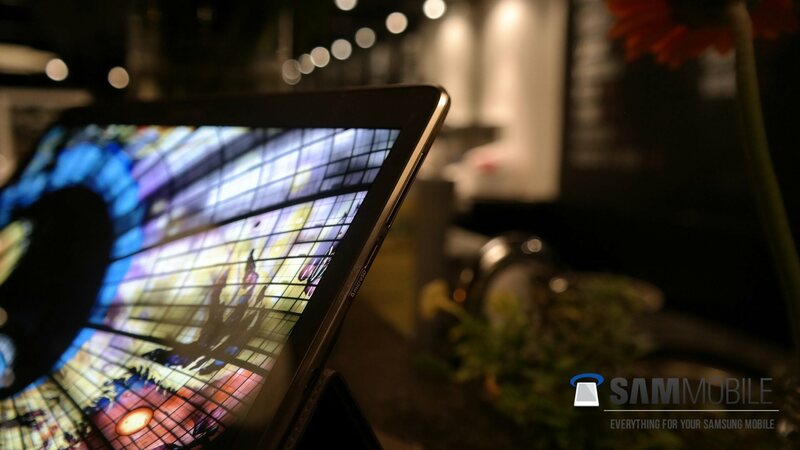 From our time with the Galaxy Tab S, it was pretty simple – offer consumers the beauty and fidelity of AMOLED displays on large-screen devices, while offering some of the features from its latest flagship smartphone on tablets. 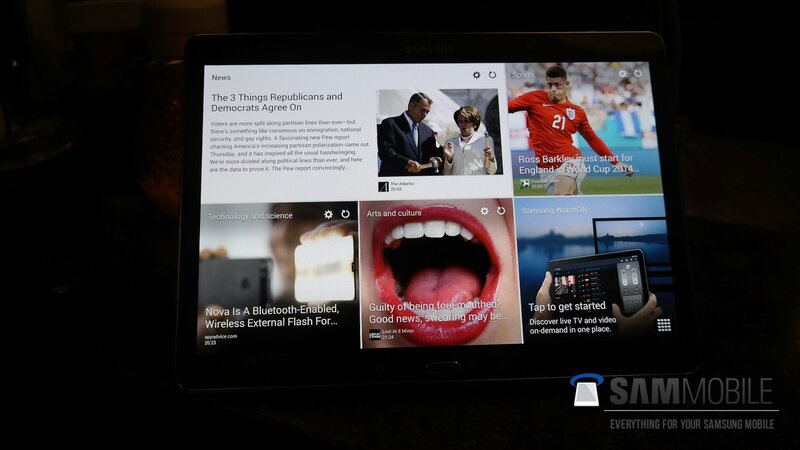 The displays are amazing, both tablets feel light and extremely ergonomic to hold while looking stunning, and the software offers the same feature-packed and productive experience that we have come to expect from Samsung’s tablets. 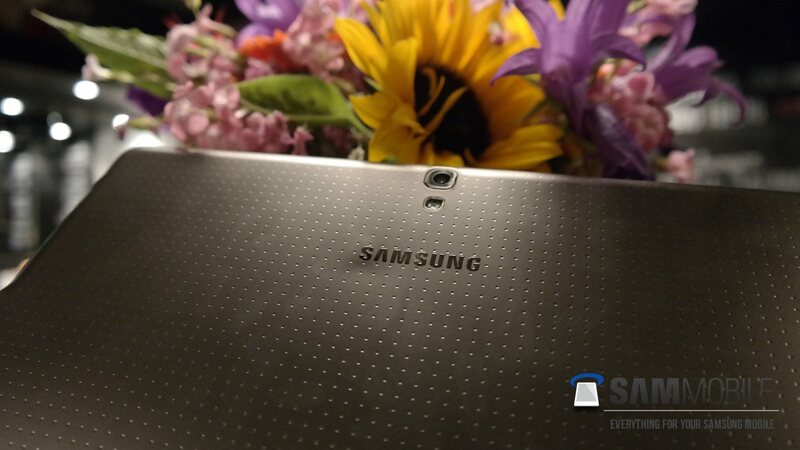 As usual, we will be doing a full review of both variants of the Galaxy Tab S, so stay tuned to find out just how good Samsung’s AMOLED tablets really are.